Samick Digital Pianos offer many advantages that you may not be aware of. Digital pianos require no tuning or maintenance. Ever. They are not as susceptible to moisture as their acoustic counterparts allowing them to be placed just about anywhere in your home. Digitals tend to be lighter, smaller and more easily moved. You can play and practice with a digital piano in complete privacy using headphones. Smaller homes, apartments, thinner walls, like digital pianos. Digital pianos go way beyond pianos. There are hundreds of voices and sounds from organs, harpsichords, strings and more. Computer connectivity and the digital piano’s ability to play back music makes it something for everyone in the family, not just the player. The advent of online lessons makes digital pianos an even more interesting choice! Established in 1958, Samick Music Corporation is a relatively young company but represents some of the oldest, most respected Piano names in the industry. If there was ever a piano in your family’s history, they probably owned one of the Samick family of the world’s great pianos. Corporate headquarters are located in Korea in the middle of one of the economic and technology centers of today’s world. US Headquarters are in Gallatin, TN. Appropriately, just north of Nashville, TN. (Music City USA.) While we’re in Nashville we should mention Samick Music Corporation is the largest guitar manufacturer in the world. We build our own brands and build many of the guitars whose names would surprise you. With factories located in the USA, China, and Indonesia, we are able to produce great products that represent incredible value. Samick’s digital pianos are a big part of this world based product and design quality. The design and technology of Samick digital pianos start at the original sources. Our digital pianos have content and design from Germany and Italy as well as the USA. 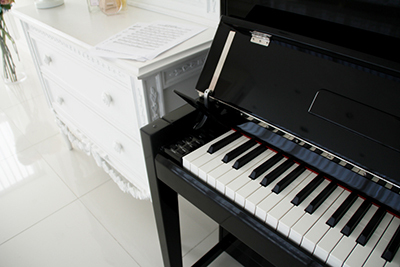 Beautiful cabinet design and craftsmanship you could only expect from a European piano company. The sounds and the user interface of our digital pianos are exceptional! In the world of pianos, no one knows pianos as well as those manufacturers that actually build and design acoustic Concert Grand Pianos. You have to get that right first and then everything else follows. The Samick story continues to be written daily. We are honored that you would consider making us a part of your own history. Welcome to our family.